So guys, I was doing yoga on Thursday night and I injured myself pretty bad. I had an old injury flare up (a ligament I tore a few years back is giving me some trouble), and I've been out of commission since Friday. Then to top it all off, my pup bit me last night (it was an accident), on the same foot. So - needless to say, I decided to take today off, because I'm in pain and can't really move around. What am I doing with my day off? Well right now, I'm enjoying a documentary on the Eames' on Netflix, called, Eames: The Architect and the Painter. It's been in my queue for a couple of weeks now, and I'm excited to finally have the chance to watch it. It's really interesting, and I am enjoying it. James Franco does the narration too - which is kind of cool. I figured that if it's at least a documentary about design, then I am sort of working, right? :P It's research, I swear! I think that it's pretty amazing to see how Charles and Ray Eames worked together to create so many beautiful things, and a lifestyle for a generation. I really like watching artist documentaries, I always feel inspired afterwards. And I could use some inspiration after a pretty dull few days.. So while I take my unexpected day off (and maybe edit some more photos), maybe you should check out the documentary too! Take a cue from Charles Eames, and "take your pleasure seriously." 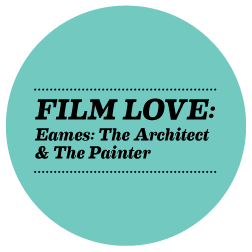 Watch Eames: The Architect and the Painter on Netflix, or stream it from the PBS website! Looking for Polka Dotted Pixels around the web? Follow me on Bloglovin', Pinterest, Twitter, Instagram, and Dribbble! Image belongs to First Run Features.